A new report released by the Alliance for Biking and Walking ranks Philadelphia seventh in the United States among large American cities whose populations either bike or walk to work. The 2016 Benchmarking Report analyzed data from all fifty states to produce a series of rankings and demographic breakdowns of commuter trends. In Philadelphia, we've seen modest increases since the last study, building on percentages that are above the national average but well below several major U.S. cities. Combined, 10.6 percent of Philadelphia commuters either ride a bike (2.1 percent) or walk to work (8.5 percent), compared to 26.3 percent who take public transit, according to the report. In terms of walking, Philly is behind cities like first place Boston (14.8 percent), Washington D.C. (12.6 percent) and San Francisco (10.2 percent). For bikers, the top three cities are Portland (6.1 percent), Washington D.C. (4 percent) and Minneapolis (3.9 percent). Year to year, Philadelphia saw a 1.1 percent increase in bike commuters and a 0.2 percent increase in walkers. 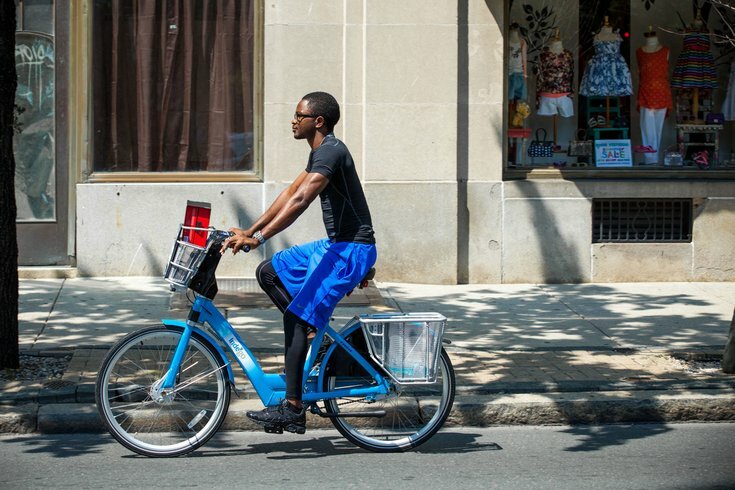 The report offers some encouraging news for Indego, Philly's bike-share program that launched last year but has struggled to gain traction among lower-income residents. Nationwide, the Alliance for Biking and Walking found that low-income households (under $20,000) accounted for 17 percent of total foot, bike and transit trips. Individuals in that category made up 21 percent of all U.S. walking trips, 13 percent of all biking trips and 35 percent of public transit trips. Another factor included in the report was gender: among the 51 percent of the U.S. population that's female, women represented 51 percent of all U.S. walking trips, but just 24 percent of all U.S. biking trips. In the most populous cities, women represented an average 49 percent of walkers and 29 percent of commuters. How closely these numbers relate to public health data is hard to determine, but for what it's worth, the report provided some information about some key conditions in Philadelphia and other U.S. cities. • 63 percent of Philadelphia adults are overweight or obese, a change in percentage of three points above the 2005-2012 period. • 11 percent of Philadelphia adults have diabetes, a change in percentage of five points above the 2005-2012 period. • 30 percent of Philadelphia adults have high blood pressure, a change in percentage of two points above the 2005-2012 period. Overall, the report examined when and why Americans use their bikes. Sixty-two percent of the time, it's for social or recreational purposes, compared to 18 percent for family or personal reasons, 13 percent to earn a living, 6 percent for church or school, and one percent for other reasons. To download the full report, which also details pedestrian fatality statistics, head over to the Alliance for Biking and Walking.